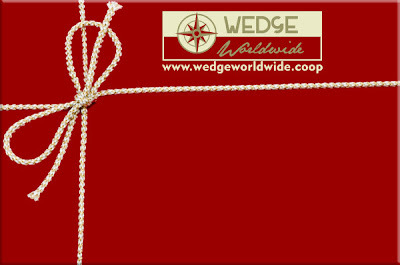 We are so excited to announce that Wedge Worldwide now offers e-gift certificates! Would you love to give gifts this holiday season that support Fair Trade and tread lightly on the earth but aren't quite sure what to get for that special someone? Now it's possible to complete your holiday shopping in minutes while getting everyone on your list the perfect gift. Visit us at wedgeworldwide.coop and click the e-gift certificate link on our front page. Here you can view the few easy steps you can take to quickly and easily buy a Wedge Worldwide e-gift certificate for your friends and loved ones. With just a couple clicks of the mouse a colorful gift certificate email will be sent to the lucky recipient. E-gift certificates are available in amounts from ten to two hundred dollars so you can select an amount that supports any level of shopping; from a gourmet treat to natural body care products to the luxurious experience of selecting a variety of products. At Wedge Wordlwide, we have carefully selected only the finest eco-friendly and Fair Trade products available. We also support businesses that are socially responsible. Many of the companies and artists we work with share a portion of their profits with their communities and give aid to worthy causes such as the environment. Anyone on your list is sure to be delighted by shopping our diverse, fun and visually appealing web site where they can feel good about the causes their purchases support. Socially conscious holiday shopping has never been easier this year on Wedge Worldwide!